Many would conclude from our blog and instagram posts that Abbi and I are sellouts that comfortably car camp and never really rough it, and I mostly agree with you. In fact, even when we backpack we do so comfortably and are far from living the dirtbag life. Sue me. This post will cover several pieces of gear we deem essential for the backcountry when we do go backpacking. We set up several tents in our local REI and landed on the REI Quarter Dome 3. We bought the footprint (tarp specifically designed to accompany the tent) and haven’t looked back. We’ve camped in a number of environments and have no complaints. I do recommend however that one does not pitch the tent with major wind blowing directly into either vestibule…This picture of our campsite on Yosemite Point depicts the collapsing nature of the Quarter Dome 3 when pitched in the perfectly wrong direction. Good times, and the tent did not completely collapse, so kudos there! As previously revealed, we eat relatively poorly when traveling. The ruling stands for backpacking. Dinners are our only hot meals and often involve Ramen Noodles. We have used a few cook systems and have favored the Jetboil Flash. It’s the most fuel-efficient stove and we like the ease of use. Its also great for backpacking because its self contained packing (fuel, burner, stand and utensils all fit inside the cup.) I’ll also note that the Jetboil Logo turns yellow when the temperature of contents reaches boiling. Cool/Sick/Gnar party trick. Our runner up is the Snow Peak Gigapower, which is super light and accommodates any pot/pan. Granted my own water quality standards are low as I’m known to drink straight from the source (I recognize this is ignorant) we filter water in the backcountry. My early experiences with filtration were quite disheartening. Spending 10+ minutes filling reservoirs and then 10++ minutes squashing them back into our packs was without chill. Then I was introduced to the Sawyer Squeeze System and purchased one within the hour. The squeeze is a clear winner on several fronts as far as I’m concerned. Weight, ease of servicing in the field, size, and system configuration make this filter a no brainer for what Abbi and I need. The fast fill adapter kit enables me to fill a 3 liter reservoir without removing it from my pack and without taking my pack off. Pretty gnarly tbh. 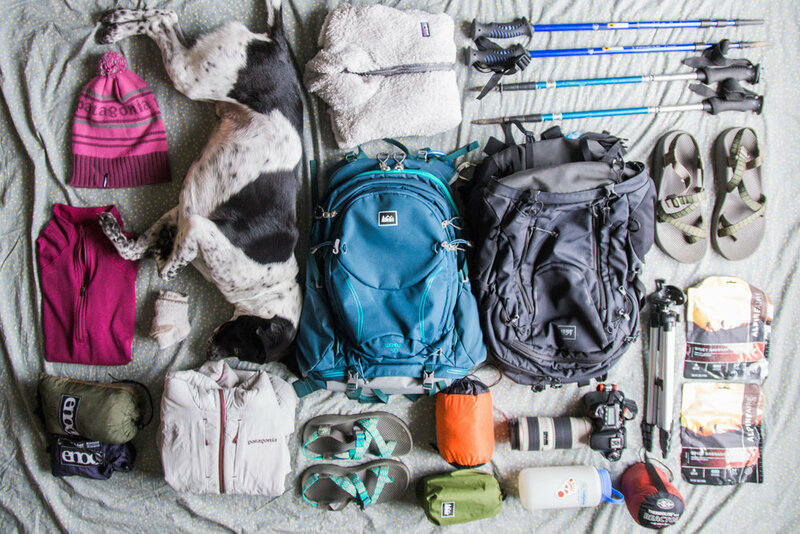 Getting into backpacking can be a bit overwhelming from a gear perspective. Tent, sleeping bag, pad, pack, water, footwear, cook systems… the list goes on. When I worked at REI, I always loved telling customers that they don’t need to buy every piece of gear in the backpacking category. I’d share with them that most of the gear in the store was invented within the past few decades and people have been, at least unintentionally, backpacking since the beginning of time. Yes buying the latest and greatest makes for a more comfortable backcountry experience, but a relatively miserable gear-deprived trek is still better than the status quo, in my possibly manic opinion. If you have a backpack, you can put some things in it and walk into nature, attempt to sleep, and then walk back. That being said I do recommend you have some sort of backpack. Abbi and I happen to have these. Abbi’s Lookout 40 has since been replaced with the REI Trail 40, much to my disappointment.